These are the Androids you're looking for. The Android operating system was introduced in February 2009 and runs on all Android smartphones and tablets. Since Android is open source, some devices have a custom version of the OS, but most have a similar look and feel and share the same functionality. Each version of the OS has a corresponding number, and since the release of Android 1.5 Cupcake in April 2009, a dessert name appended to it. Below you'll find a history of the OS including Android version names, when each was released, and what they added to the platform. Current version: 9.0 Beta 4; released on July 25, 2018. The latest Android version, 9.0 Pie, adds an array of features aimed to help you use your smartphone less, including a new dashboard that helps you monitor your smartphone usage, and several ways to mute notifications when you're busy or trying to sleep. It also has features that learn from your behavior, like offering to disable notifications you frequently dismiss and giving the apps you use more often battery priority. See our guide to Android Pie for more detail about this OS update. Final version: 8.1; released on December 5, 2017. Initial version: Released on August 21, 2017. Android 8.0 Oreo's release coincided with Go Edition, the company's lighter OS for low-end devices. Android Go brought stock Android to cheaper devices that didn't have the storage space for the full-blown OS. It also added a few usability enhancements and fixed a controversial emoji. Final version: 7.1.2; released on April 4, 2017. Initial version: Released on August 22, 2016. Modified versions of the Android OS are often ahead of the curve. Android 7.0 Nougat added support for split-screen functionality, a feature that companies like Samsung already offered. It also added more inclusive emojis with more skin and hair options. Final version: 6.0.1; released on December 7, 2015. Initial version: Released on October 5, 2015. Android 6.0 Marshmallow introduced Do Not Disturb, previously known as Priority Mode. It was a vast improvement, as it enabled users to mute all notifications during a specified time or only allow alarms or priority alerts. Do Not Disturb was a boon for those sitting in meetings or tired of being awoken by buzzes on their nightstand. The other big advance was app permissions were no longer all or nothing; users could choose which permissions to allow and which to block, to better protect their privacy. Android Marshmallow was the first Android OS to support mobile payments via Android Pay, now known as Google Pay. Final version: 5.1.1; released on April 21, 2015. Initial version: Released on November 12, 2014. Android 5.0 Lollipop is no longer supported by Google. Android 5.0 Lollipop introduced Google's Material Design language, which controlled the interface's look and feel and extended throughout Google's mobile apps. It also added a new way to transfer data between phones, and a security feature in which a device remains locked until the owner signs into their Google account, even if the thief manages to reset the device to factory settings. Finally, Smart Lock kept your phone from locking when you're in a trusted place such as at home or at work, or when its connected to a trusted device, like a smartwatch or Bluetooth speaker. Final version: 4.4.4; released on June 19, 2014. Initial version: Released on October 31, 2013. Android 4.4 KitKat is no longer supported by Google. Android KitKat's code name was Key Lime Pie; the Android team thought key lime pie was an unfamiliar taste for the masses, though, and went with KitKat instead. Android and Nestle made a deal, and it was so hush-hush that many Googlers didn't know about it until the company unveiled the KitKat statue at the company's Silicon Valley campus. The update included expanded device support compared to previous versions of the OS and included the release of Wear OS (formerly Android Wear) by Google. The Wear OS updates (4.4W) were exclusive to smartwatches and released on June 25, 2014. The last update (4.4W.2) released on October 21, 2014. Final version: 4.3.1; released on October 3, 2013. Initial version: Released on July 9, 2012. Android 4.1 Jelly Bean is no longer supported by Google. Android Jelly Bean continued the trend of enhancing notification options, including custom app notifications. It also added Actionable Notifications for more applications, which allowed users to respond to notifications without launching the corresponding app. The update also included several accessibility improvements such as triple-tapping to magnify the screen, two-finger gestures, Text-to-speech output, and Gesture Mode navigation for blind users. Final version: 4.0.4; released on March 29, 2012. Initial version: Released on October 18, 2011. Android 4.0 Ice Cream Sandwich is no longer supported by Google. Android 4.0 Ice Cream Sandwich added a few functionalities that are now ubiquitous, like screenshot capture, a Face Unlock feature and a built-in photo editor. It also introduced Android Beam, enabling users to tap the back of their phones together to share photos, videos, contact information, and other data using NFC. On March 6, 2012, the Google Play store was announced, merging the Android Market, Google Music, and the Google eBookstore together. This update rolled out to devices running Android 2.2 or later. Final version: 3.2.6; released in February 2012. Initial version: Released on February 22, 2011. Android 3.0 Honeycomb is no longer supported by Google. Android Honeycomb was a tablet-only OS and added features to make the Android interface compatible with larger screens; some features are still available today, like Recent Applications. Final version: 2.3.7; released on September 21, 2011. Initial version: Released on December 6, 2010. 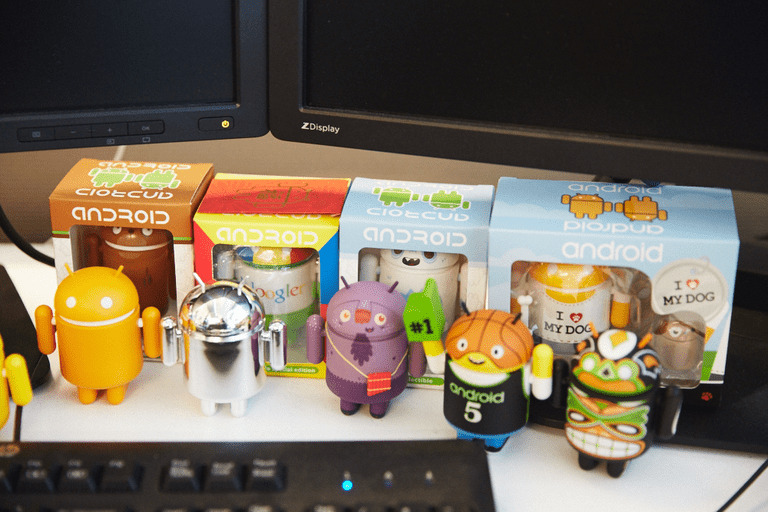 Android 2.3 Gingerbread is no longer supported by Google. Android 2.3 Gingerbread brought a handful of enhancements including NFC and multiple camera support. It was also the first OS update to feature an Easter Egg, which was a Droid standing next to a zombie gingerbread man, with a bunch of zombies in the background. This update also brought us Google Talk, often referred to as Google Chat, Gchat, and a few other names. Now it's been replaced by Google Hangouts, but people still tend to call it Gchat. Final version: 2.2.3; released on November 21, 2011. Initial version: Released on May 20, 2010. Android 2.2 Froyo is no longer supported by Google. Android Froyo added a function that many of us now take for granted: push notifications in which an app can send an alert regardless of whether it's in use or if it's even open. Final version: 2.1; released on January 12, 2012. Initial version: Released on October 26, 2009. Android 2.0 Éclair is no longer supported by Google. Android 2.0 Éclair added support for more screen sizes and resolutions, and some basic functionality such as tapping a contact to make a call or compose a text message. Initial & final version: Released on September 15, 2009. Android 1.6 Donut is no longer supported by Google. Android Donut added some usability-related enhancements to the OS, including better search and photo gallery improvements. Initial & final version: Released on April 27, 2009. Android 1.5 Cupcake is no longer supported by Google. Android 1.5 Cupcake is the first version of the OS to have an official dessert name and introduced a touch keyboard and a few interface enhancements. Final version: 1.1; released on September 23, 2008, and called Petit Four internally. Initial version: Released on February 9, 2009. Android 1.0 is no longer supported by Google. The first Android smartphone, the HTC Dream, also known as the T-Mobile G1 in the United States, shipped with Android 1.0, which did not yet have a confectionary nickname. The HTC Dream also came to market in September 2008; in the U.S., the phone was exclusive to T-Mobile. It had a slide-out keyboard instead of an onscreen one, and clickable trackball for navigation. At the time, the Android Market was where you got apps.